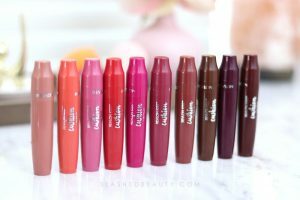 Over the past few months I’ve been trying out many Lush brand favorites for the first time, thanks to my friend Christine who bought me a handful of their items for Christmas. Although I used up my slice of the Snowcake soap too quickly to review, I wanted to talk about one of their hand lotions that do good things for more than just your skin. 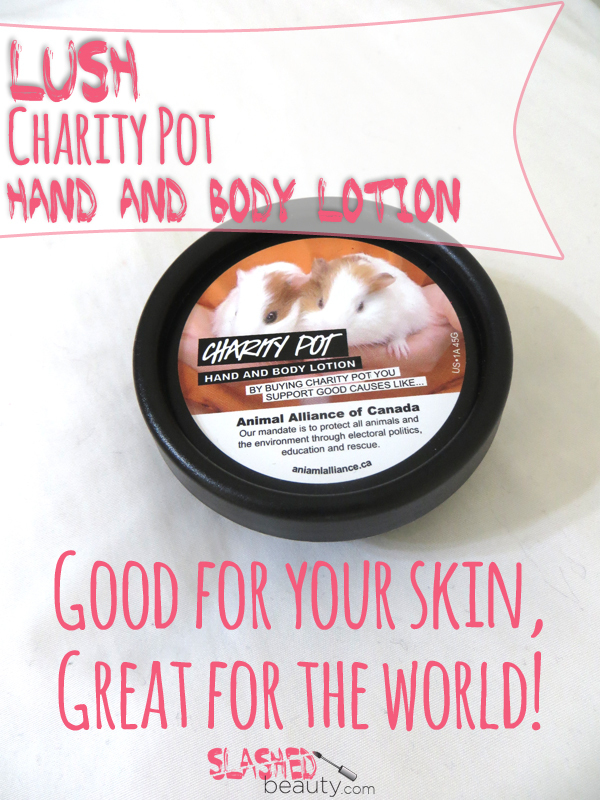 Charity Pot is a hand and body lotion that contributes to a good cause with each purchase. 100% of the price goes to various grassroots organizations that are in need of a little help to continue doing their work. Most charities align with Lush’s core values of environmental conservation, animal welfare, and human rights. 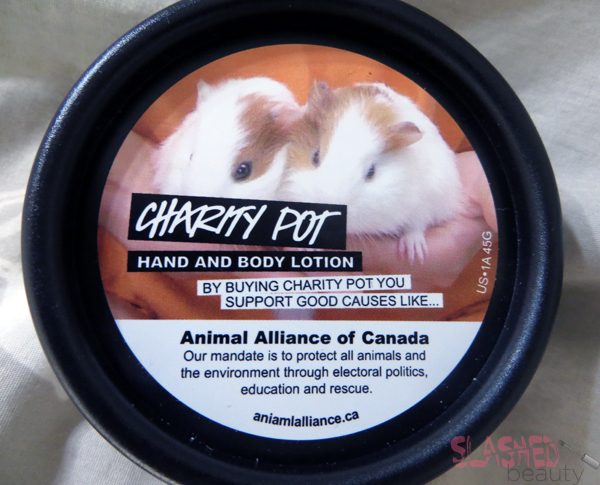 My little jar of Charity Pot supported the Animal Alliance of Canada, whose mission is to protect all animals and the environment through politics, education and rescue. I hear that! Christine is a vegan and all around animal lover, and I’m glad she chose this specific cause when choosing which jar to get for me. Although, I did notice that Lush misprinted the organization’s website on the label. To find out more about the Animal Alliance of Canada, go to AnimalAlliance.ca. 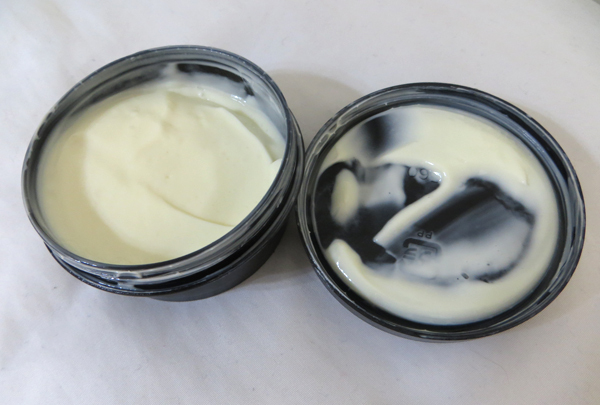 The lotion itself is made with cocoa butter, almond oil, and ylang ylang. It has a thin, creamy consistency but surprisingly offers intense moisture that can last about two hours (I am OCD about washing my hands throughout the day, so it will probably last longer on a normal person, ha). Either way, it makes my skin feel really soft, smooth, and it soothes dry patches. I’ve incorporated it into my home manicure routine, since it also improves the appearance of my cuticles. I must say, though, the scent of Charity Pot took some getting used to. The first thing that came to mind was diaper ointment… I honestly can’t describe it any other way. It’s not medicinal… it’s just a bit heavy and also lingers. My little container costs $5.95 for 1.7 oz of product, but they also sell larger “pots” at $22.95 for 8 oz of product. Either way, it’s all going to benefit a great cause. I wonder if this counts as a tax write off…? Despite the smell, I would certainly purchase this for the great moisturizing benefits as well as supporting different organizations. You can buy it in stores or online at Lush.com. What is your favorite Lush product? I’ve only just started to explore the brand, and would love to hear suggestions! 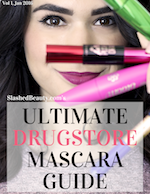 Previous article5 Bad Beauty Habits to Break… Right Now! The only thing I hate about LUSH is visiting their store – I always walk out with a migraine because all the different scents in the air get a bit overwhelming when combined. That’s a pretty great price – I don’t have too much experience with Lush, but agree that some of their products take a bit getting used to! I’ve never tried LUSH, but I want to. I want to try Lemony Flutter – the nail community raves about it! I can’t believe they flubbed the website on their label! I love the charity aspect of this though! I love LUSH! I haven’t tried the Charity Pot but it sounds nice. I love their powders, Snowcake, Fairy Dust anything, Lemony Flutter cuticle butter, and the perfumes too. Oh the massage bars are amazing too! I love LUSH products and the charity aspect makes it THAT much better! I’m not familiar with that trade in program, what is it!? I’ve never tried Charity Pot before but I’m a huge fan of LUSH! I love Lush! I have an order right now I am waiting on! It is my first time ordering with them online and it is taking a while. But, I know the wait will be worth it. I love their bath bombs and the 9 to 5 face cleanser is an awesome makeup remover. mm I love Lush! I have never tried Charity Pot though – Guess I need to make a trip to the store! The ingredients sound great. The smell…. not so much. I dislike the smell of these as well, but I still buy them for the charity aspect. Great post! I love the charity thing. I think its such a great thing for companies to do. I have yet to try lush but I think I am going to soon! I hear nothing but good things!! I’m going to get one of those, because I love LUSH and all the various charities they support. Don’t think I can dish out $23 for the big jar, but I at least can grab the little pot 🙂 Thank you for the review!